Aimee Rubensteen, right, visits Holocaust survivors, as well as second and third generation survivors who have kept family photos and letters. 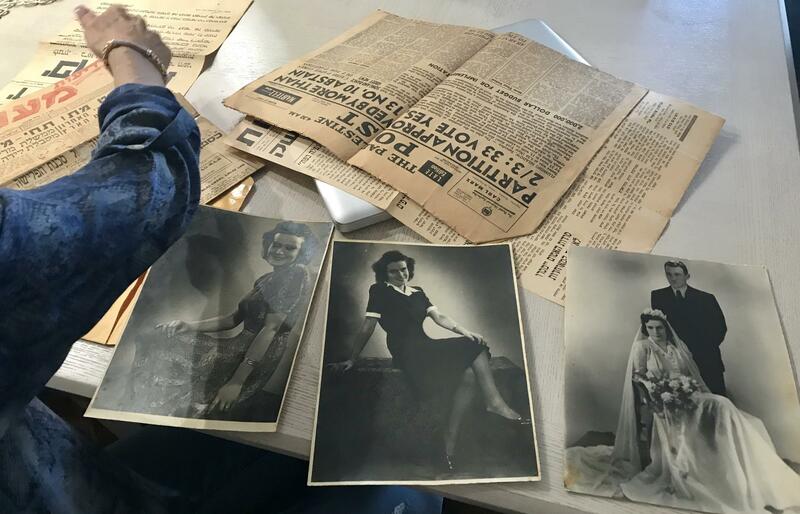 Aimee Rubensteen is working to find Holocaust survivors in South Florida, meet with them, and preserve their family artifacts. She's the first Acquisitions Curator for the United States Holocaust Memorial Museum dedicated specifically to preserving artifacts found in South Florida. Palm Beach, Broward, and Miami-Dade Counties are home to one of the country's largest groups of Holocaust survivors. And Rubensteen, who was hired earlier this year, is racing against the clock. The youngest people who survived the Holocaust are now around 75 years-old. The Washington, D.C.-based U.S. Holocaust Memorial Museum has had a curator dedicated to the New York region since 2015. The museum's Southeast Regional Director, Robert Tanen, waited for the private funding to come through for a South Florida curator for about four years. Rubensteen comes to the role in South Florida as someone with lots of museum experience - the Guggenheim, Sotheby's - but also personal experience: three of her grandparents are survivors of the Holocaust. Rubensteen grew up in Hollywood hearing firsthand stories about one of her grandmothers being taken from her home in Hungary, and surviving Auschwitz. "My grandmother passed away about a year and a half ago, right before I started this job, so in a way it's even more incredible for me to be doing this work," Rubensteen said. "I think having such a close connection with her really enables me to do this work as quickly and as sensitively as possible." Rubensteen spends most of her time somewhere on the road between Palm Beach and Homestead. She meets with about one new survivor each week. She's looking for objects that show what daily life was like around the time of the Holocaust. "Original family photographs, handwritten letters, documentation that might include immigration information, or receipts that people kept when they crossed borders...passports...luggage tags," Rubensteen rattled off the list. "It really could be any object that is providing testimonial evidence of an individual's experience through the war," she said. Before he gave the physical copies of the letters and postcards to Rubensteen, Tarjan translated each one from Hungarian to English. 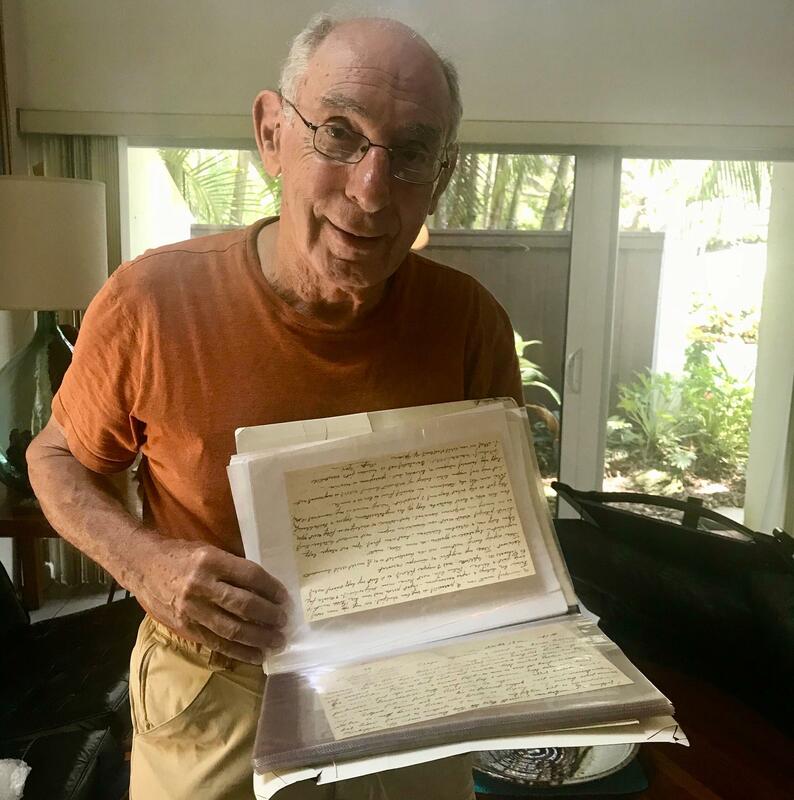 Peter Tarjan, 82, had been waiting a long time to decide whether or not he wanted to donate old family letters to the U.S. Holocaust Memorial Museum. "It just took a long time to make the decision to give them up," he said. "Three decades." He'd looked into the process, but that was before Rubensteen started in her role as South Florida Acquisitions Curator in April. "When we are gone, most of it is going to be in the trash, so I was afraid some of these papers would end up that way and I'd rather give them up now," Tarjan said. "They are fragile, they are old, they are fading. If they stay here, they will continue to fade, deteriorate. And if I hand it over to a competent museum, then they will preserve it." So in July Tarjan handed about 45 letters and postcards over to Rubensteen and the U.S. Holocaust Memorial Museum. They are his family's last correspondences to each other, before many of them were killed. Tarjan was eight years old when the war came to Budapest, Hungary. He lost both of his parents to death marches to concentration camps. The letters are the only connection he has left to his family. "Letters which my grandmother wrote to her daughters on stationary that she inherited from her uncle - secondhand stationery," Tarjan said, smiling. Tarjan's grandparents, Api and Anya, wrote that postcard to his aunt in May 1944, from inside a Hungarian ghetto. They were later killed in Auschwitz. "My dear Agatha, at last finally we got some news from you, I was very afraid that you had some troubles and that's why you didn't write. You are right my dear Agi, it would be wonderful to see each other...But I don't have the energy to hope." Parting ways with old family letters, photos, and stories was an emotional decision, but it's one that Tarjan knows is important. "The older I get, the more I feel that way," Tarjan said. "Anti-semitism doesn't disappear when the war ends. It continued in more subtle ways, but it never stopped." After his parents were taken, Tarjan was sent to an orphanage. Then his mother's best friend took him in. By the time the war ended, two surviving aunts were his only family - one from each side. He left Hungary during the uprising of 1956 and came to the U.S. He's been living in the Miami area - now Kendall - for 50 years. His cat, Jodi, never leaves his side. Tarjan started the group South Florida Child Survivors of the Holocaust in 1990, though the group doesn't meet much anymore. Rubensteen said Tarjan's family letters show exactly what she wants to be able to rescue and preserve for the museum: everyday emotions. "Handwritten letters with just everyday feelings and experiences - or a 'Dear diary' format - provides a tiny glimpse that's invaluable," she said. Like Tarjan, Rubensteen said many survivors have kept their memories from the time hidden. "Not everyone has shared their story yet. Even people in their 80s, 90s, 100s, they haven't shared their story," she said. "And the people that have, have perhaps only shared it with a few people." Chaia Cohen shows Aimee Rubensteen more pictures of her mother, and some other newspapers that she hasn't donated to the U.S. Holocaust Memorial Museum yet. Chaia Cohen didn't hear much about the horrors growing up. "I didn't realize that I ... should ask questions," she said. "I was only 17 when my father died. Then, life took over and I never really asked much." Cohen, 68, was born after the war was over -- but she grew up surrounded by its effects. Her parents survived working in the concentration camps at Auschwitz-Birkenau and Dachau - but they never talked to her about their pain. What Cohen knows about her family is what she overheard when her parents' friends would come over. "Extra! Extra! 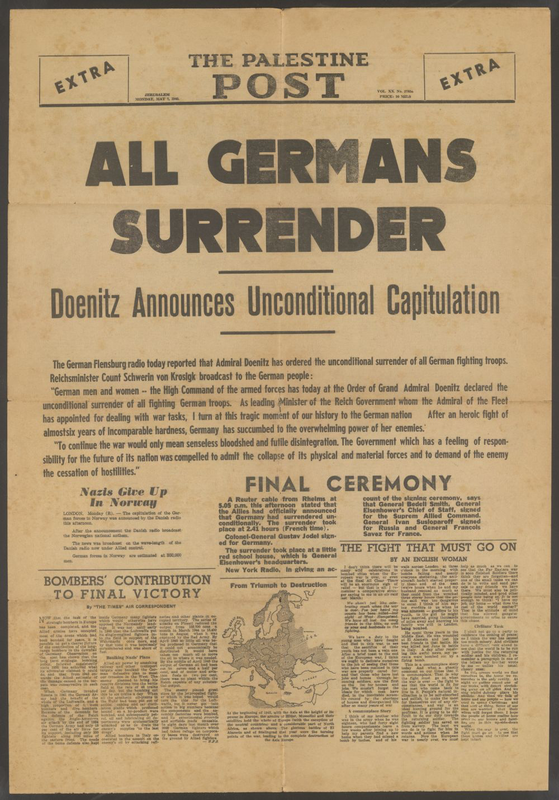 All German Surrender" - May 7, 1945. Cohen's parents were given this copy of the Palestine Post announcing the war had ended, a few years late, after they were safe in Israel. Friends of Cohen's parents gave the paper to them once they moved to Israel. Cohen found it in her mother's apartment after she died. "I was just sitting there and crying for every shirt I took out from the closet, so when I got this...I wasn't even sure what I had," Cohen said. "L.A. was too expensive, New York was too cold, and we ended up in Miami. And L.A. is still too expensive and New York is still too cold." Forty years later the family is still here. Over the summer, in June, Ornit decided to donate the newspaper. "I cried, and she's like, 'Your sisters don't want this, what should I do with it?'" Ornit said. "And I was like, 'I'll take it!'" A co-worker suggested it could be worth donating to the U.S. Holocaust Memorial Museum. Ornit emailed the museum repeatedly, but didn't hear back until Rubensteen became South Florida Curator. Ornit said her kids motivated her to donate the paper in the first place. "My thoughts were, one day my kids could look it up and know what I've talked about all these years," she said. Ornit is worried about the safety of Jews in the U.S. She cites the rise of anti-semitic hate crimes over the past two years, (according to the Anti-Defamation League) - and the tragedy at the Tree of Life Synagogue in Pittsburgh, where 11 people were killed during worship services last October. "I feel like it's becoming less safe here," she said. "I feel that most American Jews - my generation - are less in touch and in tune with history, and they're more willing to allow it to repeat itself." Despite all the pain of looking at her family's history, Cohen said she doesn't want it to be forgotten. "They did not win. We won," she said of the Nazis. "I have my three daughters, I have five grandkids - they will have kids and kids and we're gonna grow and nobody is going to get rid of us. We are here to stay." Showing what that looks like - tangibly - is how Aimee Rubensteen sees her role as the U.S. Holocaust Memorial Museum’s acquisitions curator for South Florida. "I tell them that I'm here to advocate for the object,” she said. “I’m here, because if you think this object is important we need to preserve it." Histories, that might otherwise have been lost.